Nigel Kennedy says his new album is all my fault – half of it, anyway. He recalls that we were sitting around his place six or seven years ago discussing Polish music – he was newly in love with Agniezska, a quiet law student, now his wife – and I mentioned the violin concerto by Mieczyslaw Karlowicz, a young composer who died in a Tatras mountain avalanche in 1909. ‘Have you got it?’ said Nigel. I dropped around a copy (he lives just up the road). He dropped it back a few weeks later with a disparaging remark. ‘Too much like Strauss,’ is what he insists he said; I remember him calling the piece soft, mushy, and something less polite. But time moves on, and tastes change. He recorded the concerto with another by Emil Mlynarski, founder of the Warsaw Philharmonic and father-in-law of the pianist Arthur Rubinstein. Neither work has been played outside Poland in living memory. Nigel named the album Polish Spirit and adorned the front cover typically with half-empty vodka bottles; on the back, he giggles, you can find a marijuana roach. Nigel Kennedy is 50 years old, a husband and father; but part of him, and not the most endearing part, remains a rebellious schoolboy. He spends half his time these days in Cracow with Agniezska, her extended family and his jazz quintet. The only other ensemble he works with on a regular basis is the Polish Chamber Orchestra. He burned his bridges with the London orchestras six years ago by accusing them, rightly, of failing to give soloists enough rehearsal time and he has generally cut back classical work to just three months of the year, devoting the rest to jazz gigs and composition. 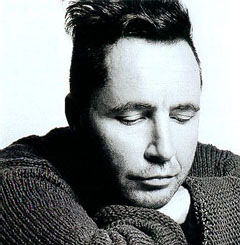 For all the effing and blinding, the bovver boots, the two-day stubble and the Aston Villa football shirts, Nigel Kennedy is an old-fashioned softie who loves nothing better than to bring a glisten to an audience’s eyes. He is, by a margin of millions, the biggest selling classical artist on EMI and the only living violinist with global street cred. He’ll be on a plane tonight to China, where he is a youth icon. In enforced idleness, ‘I went to hear a lot of other people play, went to galleries, enjoyed London in a way that I can’t normally do. I became a regular at the Vortex in Hackney. It was quite a positive time. I got to spend more time with my wife.’ The family side of Nigel, never seen on his trench coat sleeve, is unforced. He is devoted to his aged mother who, though she can hardly walk, refuses the indignity of attending concerts in a wheelchair. Agniezska has brought tranquillity to his turmoil and what draws him back to London every few weeks is his eleven year-old son (by an earlier relationship), Sark, whose rising height is pencilled against a wooden pillar in Nigel’s Swiss Cottage living room. What attracts him to Poland, Agniezska apart, is ‘the way of life that I so much like. Cracow has a live culture, not overridden by jukebox mentality and automated TV.’ He has mastered basic Polish – ‘I can get the beers, I can get the food, I can get sympathy, even pity if I need it’ – but he is not blinkered to political realities and loathes the reactionary Kaczynski twins who as president and prime minister face national elections this weekend. ‘They call the Poles who come over here traitors and cowards, while benefiting from reduced unemployment figures. There’s a right wing swing in Poland. Radio Maria is anti-gay, anti-Semitic. I’ve got a very good friend who’s Jamaican, and I’ve noticed some different reactions to him. At Polish immigration, it’s always the black guys who are stopped. Into his bifurcated life, Poland has injected a burst of classical urgency. He plans to return to the London concert hall next spring with the Royal Philharmonic – ‘they’ve given me two rehearsals, man,’ – where his father was once principal cellist and his sister works in the office. Beyond that, he is looking for a role at the heart of musical life, an orchestra to call his own, a regular piano accompanist, no longer Nigel the loner, Nigel the outcast. And then the photographer turns up and Nigel puts on dark glasses – ‘for the flu, man,’ – and dresses down in Oxfam gear while having his stubble cosmetically primped and brushed. There may be more than one Nigel Kennedy jostling inside that Villa shirt and trench coat, but the real one is sounding better all the time.